In an effort to increase voter turnout at elections, states all over the country are experimenting with easy ways to register to vote, but nobody had figured out how to make the process of voting easier—at least, in states where voters can’t mail in their ballots. But finally, it seems like some progress has been made on that front. 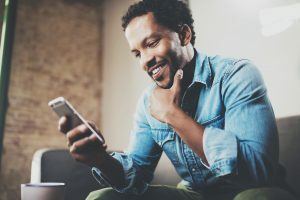 The state of West Virginia, in collaboration with Boston-based startup Voatz, has developed an app that will allow people to vote with their mobile phones. The app will work using a technology called blockchain, which allows votes to be anonymized and recorded on a public digital ledger. How does it work? First, a person using the app must first register by taking a photo of their government-issued ID and a video of their face, then upload them through the app. Voatz says its facial recognition technology will ensure that the photo and the video show the same person. Once the person is approved, they can cast their ballot using the app. Civics Lesson: Exactly Who and What Is Voatz? 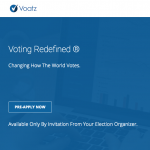 Brief research on Voatz leads first to the company’s surprisingly information-free website. The “About” section of the site only gives users the option to contact Voatz if they are an election administrator looking to use the app. The Crunchbase page for the company says it is “a mobile election voting platform, secured by smart biometrics, real time ID verification and the blockchain for irrefutability.” Crunchbase also says the company is part of the Techstars Boston 2017 cohort and that it has a total funding of $2.4 million, $2.2 million of which came in January 2018 in a funding round led by Medici Ventures. And according to Crunchbase, Voatz’ team has exactly one member—founder Nimit S. Sawhney. But there’s a problem. Many people have grave concerns about the app’s security. For those of you who need this tweet translated from “nerd-ese” to English, Beaumont means that the Voatz website is running on an extremely outdated server, with extremely lax security measures in place. Then there’s the fact that the app hasn’t been tested in any truly meaningful election. Balloting for the Rock & Roll Hall of Fame, which Voatz actually supported with its app, doesn’t count as a valid test of a balloting app for elections that could determine the future of the country. West Virginia plans to limit the use of Voatz mostly to troops serving abroad. Warner did say that these individuals can still cast a paper ballot if they prefer. State officials are also going to leave any final decision about using the app to individual counties. Considering the increasing amount of evidence that Russian actors interfered with the 2016 election and hacked into Democrats’ servers and several states’ voter registration databases, mobile voting doesn’t strike us as a terribly good idea. The absence of a paper trail is a clear problem, particularly given the importance of the upcoming midterm elections.